Iona beach is a "go to" location for migratory birds. It's "go to" because it has a large sewage treatment plant with outside settling ponds full of powering an ecosystem that wouldn't normally be so rich. It's Southern migration time which means you could see something out of the ordinary. I decided to get up early and go take a look. I've seen Caspian Tern's at Iona before. They have a distinctive raspy croak but they have always been either at a far distant ocean edge or high overhead. This morning they were near to shore fishing in high tide shallows. Their fishing is definitely not seagull like - they glide high over the water and then drop head first into the water to grab a fish, or sometimes they fly just over the surface and try to grab fish at the surface. Both were a pleasure to watch. While watching the Tern's I noticed some duck like birds vacuuming up crabs in the shallow water around the reeds. When I got home I identified these eating machines as common merganser - Juveniles. There serrated bills had a firm grasp on the small crabs and they had no problem finding them - every minute a new morsel came up from the bottom to be re-positioned and then ripped apart. 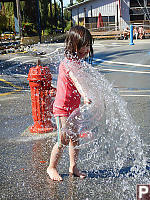 It is the end of the summer and sadly the water park at Granville Island is closing soon. We did one last day at the park and met up with some friends. Our kids wanted to go in the water park so we arrived early to make sure the line ups weren't that bad. Nara really likes the water slide - she will line up for 10 minutes just for the 15 seconds it takes to ride down. She is tall enough that she can ride on her own, but she still likes to go with Dad. We made a video. The other kids weren't so interested in water park - they wanted to play Uno. One of the surprises of having kids in daycare is that you never know what they know. My kids already know how to play Uno which was quite a surprise to me because we don't own the game. So the kids played Uno, ran around in the grass and played in the playground. A great way to spend the last summer weekend before the return to school. David is my cousin on my Mom's side. He is getting married to his long time girlfriend Shauna. We were really happy to receive the invite which was more of a package than an invite. The wedding took part over two days, with a traditional Sikh wedding on Friday and a western style wedding on Saturday. I signed the kids out of school/daycare and got them ready in their best dresses. The ceremony was being held at the Sikh temple near the border of Vancouver and Burnaby which is quite close to where I work. Food figured prominently - doors opened at 9am for breakfast (Sikh with some western favorites like pancakes). After breakfast, we made sure our heads were covered and went upstairs to the larger hall for the ceremony. You take your shoes off before you enter and sit men on the right, women on the left but kids can sit either side. We sat a bit more toward the back so we could make a quick getaway if the kids got too bored. There was a band playing and singing while we were seated. Shauna and David have 5 sisters between them so there were lots of brides maids. David had 3 groomsmen, including a brother-in-law. Everyone was especially attentive when the bridge came in on her parents arms wearing a spectacular dress. The ceremony was a mix familiar and new. There were songs sung to the couple and readings from scripture. The groom and bridge held onto a common scarf (tying the knot sort of) and walked around the alter with the help of brides maids. There was some audience participation, but it wasn't in English so there was little we could do. And then we went for lunch! Nara's favorite Saag Paneer with Naan was on offer so she was happy. It was all vegetarian so I was thrilled. My mom found the cucumber sandwiches a little spicy. Overall we had a fantastic time - the girls really loved all of the dresses and seeing the wedding actually happen. The western ceremony was on Saturday afternoon at the Hotel Vancouver. The location is amazing, the flowers were awesome, the decor was great. first cousins once removed) came down the aisle did I pick up my camera. After the ceremony there were drinks and snacks served. David's mom (my aunt) makes great perogies that were also at David's Sisters Wedding. It was fun to see everyone all dressed up with a little plate of perogies, trying desperately not to drop food on themselves. It's uncommon to have everyone in one place so we did take some photos. The family got together for my Grandfathers birthday just a few weeks before so we didn't seem to gather in large formal photos. That said, it was fun to see everyone really dressed up. Dinner was of course fabulous, followed by speeches and dancing. Thanks for the invitation - we had a great time! Like most little girls, Nara and Claira want long hair. Neither of them can work tangles out of their own hair and Claira can't hold barrettes in her bangs for more than about three minutes. Neither of them like getting their hair cut, but the stylists provide them with pocky so they behave amazingly well while their hair is being cut. Claira's stylist somehow figured out that Claira wanted curly hair (her hair is normally straight straight) and started curling it - a new look for Claira. She really liked her hair with curls. Sadly, they only lasted about an hour, but with product they might have lasted longer. It always makes me smile when the stylist gets out a mirror to show the kids of the back of their heads. Claira turns in her chair to face the mirror behind her - like it will show something novel compared to the mirror in front of her. That said, what does she care what the back of her head looks like - she doesn't see it. She just wants her hair longer and the stylist never gives here that. She will settle for pocky. I had the kids for a few hours and was looking for something to do on a raining morning. We have an Aquarium membership so we went! I've seen the advertisments on the buses in town for petting stingrays so we lined up to try that out. It's a good setup - 50 people plus can be near the pool. Unfortunaltly for kids, the rays are often pretty deep (but not always) so the shorter you are, the less likely you are to have a ray pass close enough to touch. The kids were really good about two fingers, aim for the back. I like to take photos. The kids like to watch videos of themselves when they were younger. I'm no film maker, so I decided to pick two things the kids are good at and try to make videos of them doing it. Nara loves monkey bars and Claira loves to read.